At the top of your budget, To be Budgeted represents the cash in your accounts that hasn't been budgeted yet. If it's red, you have budgeted more money than you actually have in your accounts. It's important to keep it green so you can trust the Available amounts in your categories, so you'll want to avoid budgeting future income. We'll cover how To be Budgeted is calculated—and what to do if it seems too high or too low. Right next to To be Budgeted is the breakdown of the formula. Let's take a look at each line individually. In the example above, we start with $2,000 in Funds for April. If there was any cash overspending (indicated in red) in the previous month, that amount will be deducted from the next month, because those dollars are gone. Credit overspending is handled differently. Going back to the example, it looks like there was $50 in cash overspending in March, so that's deducted from the initial $2,000. The next value is a sum of the Budgeted column in the current month. 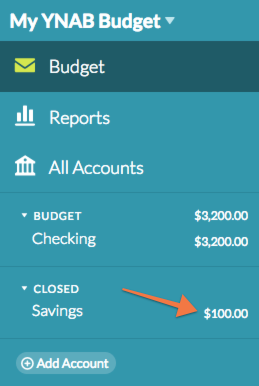 When no categories are selected, you'll also see the Total Budgeted amount in the right sidebar. Pro Tip: You can expand/collapse your category groups by using the Command-Up/Down (Control-Up/Down for PC) keyboard shortcut. So, we started with $2,000 in Funds for April, subtracted $50 in cash overspending from March, and now we're subtracting the $1,500 already budgeted in April. This final value in the equation represents any funds for the current month that have been budgeted in a future month. As you Age your Money, you may start budgeting in future months more and more. Since $250 is Budgeted in Future, that's deducted from Funds for April as well. Let's recap. After subtracting $50 in cash overspending, the $1,500 budgeted this month, and the $250 budgeted in the future, that leaves $200 To be Budgeted from the initial $2,000 in Funds for April. It's Rule One, after all. Where should the last $200 go? You could budget even more in a future month—or build up a True Expenses category. 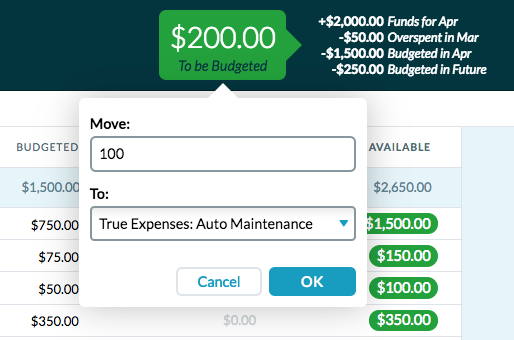 You can budget directly to the category, or you can click the To be Budgeted amount and move it to the category of your choice. To be Budgeted is too high/low! The first thing to do is reconcile all of your Budget Accounts. 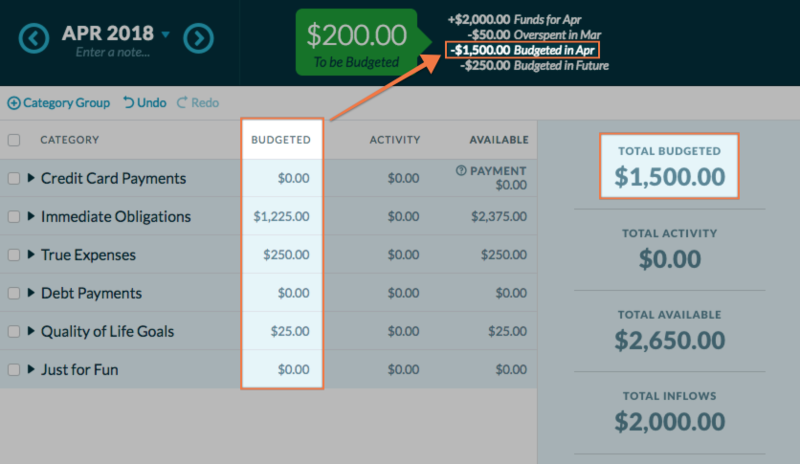 The amount To be Budgeted will only be accurate if your account balances in YNAB reflect your real-world account balances.Also, keep in mind that Tracking Accounts are not included in your budget. Now, look for any Closed Accounts with a balance. If a transaction pointing to a closed account was edited or deleted, it's possible for the account to have a positive or negative balance which impacts To be Budgeted. Maybe you've been moving money around in your budget, and you just need a little boost of confidence that every dollar in your bank account(s) is reflected in your budget. In the right sidebar, when no categories are selected, look for the Total Available amount, which is the sum of the Available column. Add the Total Available amount to what you have left To be Budgeted and Budgeted in Future. This is the total cash in your budget. Let’s pause, just in case To be Budgeted is negative. If it is, you'll need to subtract it from Total Available. Now, add up the cash in your Budget accounts. That includes checking, savings, and cash accounts, plus any positive balances on credit cards. Your totals in step 3 and 4 should match, confirming every dollar in your account is reflected in your budget—and not a single more. Now, you can confidently move money if you’d like any dollars to be in a different category!